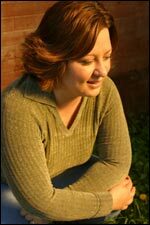 Tricia is a members of the Christian Fiction Blog Alliance. She also has a blog, It’s Real Life and a parenting blog Generation NeXt. TRICIA GOYER is the author of five novels, two nonfiction books and one children’s book. She also was named Mount Hermon Christian Writers Conference Writer of the Year in 2003. In 2005, her novel Night Song, the second title in Tricia’s World War II series, won ACFW’s Book of the Year for Best Long Historical Romance. In 2006, her novel Dawn of A Thousand Nights also won book of the Year for Long Historical Romance. Tricia and her husband, John, live with their family in northwestern Montana. Secrets abound in the ruined Spain. Michael is loving but elusive, especially about beautiful maria. The American who helped Sophie sneak into Spain turns up in odd places. Michael’s friend Jose knows more than he tells. When reports of Michael’s dissappearance reach her, Sophie is devastaed. What are her feelings for Philip, an American soldier who comes to her rescue?